Eric Longenhagen and Kiley McDaniel published their top-100 list on Monday. Other outlets have released similar lists, as well, recently — outlets including Baseball America, Baseball Prospectus, Keith Law, and MLB Pipeline. I submitted my own contribution yesterday with KATOH’s top-100 prospects. All of these lists attempt to accomplish the very same goal: both to identify and rank the best prospects. But KATOH goes about it in a very different way than the others. While most others rely heavily on scouting, KATOH focuses on statistical performance. On the whole, there’s a good deal of agreement between KATOH and the more traditional rankings. Many of KATOH’s favorite prospects have also received praise from real-live human beings who’ve watched them play. Ronald Acuna, Vladimir Guerrero, Jr., Brent Honeywell, Michael Kopech, and Kyle Tucker all fall within this group. In general, there is a lot of agreement. However, there are other KATOH favorites who’ve received little public consideration from prospect analysts. The purpose of this article is to give these prospects a little bit of attention. For each position, I’ve identified the player, among those excluded from all top-100 lists, who’s best acquitted by KATOH. These players have performed in the minors in a way that usually portends big-league success. Yet, for one reason or another, each has been overlooked by prospect evaluators. Of course, the fact that these players missed every top-100 list suggests that their physical tools are probably underwhelming. That’s very important information! Often times, the outlook for players like this is much worse than their minor-league stats would lead you to believe. There’s a reason people in the industry always say “don’t scout the stat line.” Although KATOH scouts the stat line in an intuitive fashion, it still overlooks important inputs that can predict big-league success. Still, the stat-line darlngs sometimes pan out. I performed this exact same exercise last year, as well, and I’m proud to say there were some big successes. Rhys Hoskins, Jake Faria, Ben Gamel, Chad Green, and Brandon Nimmo have each blossomed into productive big leaguers just one year out. Zach Davies and Edwin Diaz also appeared in this space two years ago. Of course, others haven’t worked out so well. Clayton Blackburn, Dylan Cozens, Ramon Flores, and Garrett Stubbs: none of them were particularly useful major leaguers in 2017. There will be hits, and there will be misses, especially when you’re dealing with non-elite prospects. Rogers hit a respectable .261/.350/.467 across two levels of A-ball last year, pairing an 11% walk rate with encouraging power. Most impressive of all, however, is that he did so as a catcher — a position where good hitters are few and far between. Rogers isn’t just any catcher, either: Clay Davenport’s defensive numbers graded him out as elite. Elite defensive catchers who can also hit a little are exceptionally valuable. He has a big leg kick to start his swing, and takes a ferocious cut with a pull-heavy approach. When his swing works, he has the power to deposit pitches in the left-field bleachers. When it doesn’t, he rolls over ground outs or hits a number of harmless pop outs. Evaluators generally see Rogers as a below-average hitter with a lot of swings and misses and average bat speed. Usually, KATOH’s catcher crushes are good hitters who are questionable behind the plate. Rogers is the exact opposite, as his offense is the questionable piece. Eric Longenhagen called him “best defensive catching prospect I’ve seen, a polished receiver and cat-like ball-blocker with a plus arm” over the summer. Even if Rogers’ A-ball numbers ultimately don’t translate, he could still be a solid regular given how little catchers hit. For example, Martin Maldonado defended his way to 1.1 WAR last year in spite of a 73 wRC+. McCarthy walked nearly as much as he struck out in Double-A last year while also demonstrating speed and a glimmer of pop. He’s also 6-foot-3, which suggests some more room for development. He’s missing defense and power but does just about everything else well. He has also succeeded in the upper levels as a 23-year-old, which bodes well for his future in the show. Mason Martin arguably deserves this spot due to his .307/.457/.630 performance in the GCL, but for mostly arbitrary reasons, I limited eligibility to to players with at least 200 PA.
He’s limited, defensively, to first base and left field and doesn’t clearly possess the explosive power necessary to profile at those positions every day… There’s a back injury (part of why he fell to round five in 2015) adding to the risk here. As a first baseman who does everything but hit for power, McCarthy certainly has an unusual profile. This isn’t necessarily a bad thing, but it is worth wondering if KATOH might be getting deceived by a player who doesn’t look like most of the data points that went into building it. In particular, KATOH sees McCarthy’s stolen-base totals and indirectly ascribes a certain amount of athleticism and/or defensive potential that may not actually be there. Even so, it’s hard to knock a guy who was such an offensive beast as a 23-year-old in Double-A. Hampson is a contact machine who has played solid middle-infield defense and posted gaudy stolen-base totals. He’s now slashed .318/.393/.455 in over 900 plate appearances as a pro. Aside from hitting for power, he’s done everything that good prospects do. The arm is light for the left side; he’ll struggle to finish plays to his right at short, and profiles better at the keystone. It’s a slash-and-dash approach at the dish… but one which might be stretched to hold against upper-level pitching. KATOH often comes up rosy on guys described as “slash-and-dash,” with Zack Granite and Mallex Smith representing a couple of the most prominent examples. Hampson’s success has come exclusively in A-ball, so it is certainly fair to question whether his shtick will continue to work three promotions from now. Still, I think there’s a good chance he does the speed-contact-defense thing again in Double-A this year and starts showing up on top-100 lists next winter. Rios has flat out mashed for two consecutive seasons now and is therefore making his second appearance on the All-KATOH squad. He split last season between Double-A and Triple-A, where he slashed .309/.362/.533 as a 23-year-old. Although he struck out a ton at the lower levels, Rios whiffed a reasonable 21% of the time last year. Although he played mostly first base at Triple-A, Clay Davenport’s numbers actually didn’t hate him at third base. Either way, he was one of the best hitters in the upper levels last year at age 23. The standard line about slow-footed corner mashers with aggressive approaches and little to offer beyond their bats is that they’ll always be challenged to prove it at every level… Rios’ extreme length and poor walk rates have led to a lot of waiting for the other shoe to drop as he’s progressed up the minor league ladder. Rios may not look like a prospect, but it’s hard to quibble with his track record. As a 23-year-old who’s already succeeded in Triple-A, Rios will likely make it to the majors this year and stick around for a while, even if it’s mainly as first baseman who struggles against lefties. Despite playing in High-A as a 20-year-old, Castro slashed a healthy .290/.337/.424 while playing shortstop, where Clay Davenport’s metrics adored his defense. Castro doesn’t stand out in any one area offensively but showed hints of contact, power, and speed last year. [Castro’s aggressive, contact-oriented approach] has worked at every stop so far, but Double-A arms will prove a stiff test for his bat in 2018, especially since there isn’t a ton of physicality or over-the-fence pop in there. I think Castro is a very exciting prospect. Even if the scouting reports are right and the power never comes, he’s still a slick-fielding shortstop who can hit a little bit. And if he does find some power in his 6-foot-1 frame, it’s easy to see how he could develop into a very good big leaguer. Granite’s back for his second tour of duty on the All-KATOH team, and frankly, his prospect case has only improved. He’s still a speed demon who plays elite center-field defense, which takes most of the pressure off of his bat. But more importantly, his offensive numbers took a huge step forward in 2017, as he hit a ridiculous .338/.392/.475 in Triple-A with an elite 11% strikeout rate. He’s also 6-foot-1, which some might find surprising given his style of play. Granite’s swing is extremely linear and his approach includes mostly bunting, slashing and sprinting his way on base… This approach probably won’t work as well at the major-league level with better defenses but Granite’s BABIP this season was a modest .312 and he still found his way on base consistently. After destroying Triple-A pitching, Granite vindicated his doubters last year when he fell on his face in his first taste of big-league action. His strikeout and walk numbers actually improved upon his promotion, but his BABIP completely cratered. Was this a small-sample fluke? Or was it Eric Longenhagen’s prediction coming true that he’d get the bat knocked out his hands? The answer is likely a combination of both. But even if Granite’s hitting doesn’t carry over and he winds up being Billy Hamilton 2.0, that’s not so bad: Hamilton, after all, still racked up 10 WAR over four years despite a 70 wRC+. Even if Granite just hits a little bit, he’s a solid regular. On the surface, Grisham’s numbers look pretty ordinary. His .223/.360/.348 batting line doesn’t jump off the page and was heavily aided by his exceptionally high walk rate. But KATOH is intrigued by his batted-ball profile and therefore thinks there’s more there than meets the eye. For one, Grisham turned about 20% of his 2016 grounders into 2017 fly balls, which intrigues KATOH. Additionally, he hit a whopping 38% of balls to center last year, which was tops among minor-league hitters with at least 140 plate appearances. Outlier alert! 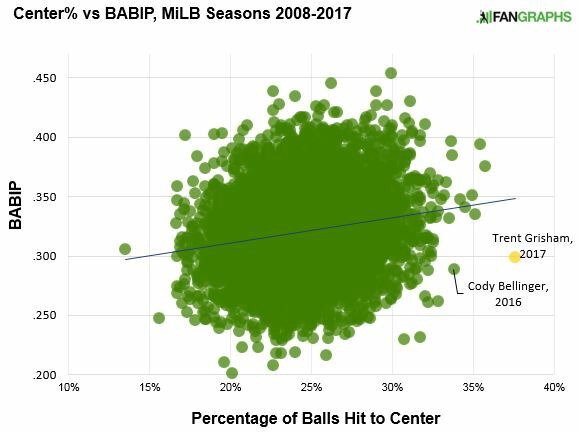 Minor leaguers who hit a ton of balls to center tend to have lofty BABIPs, yet Grisham did not at all. And more importantly, this tendency correlates with big-league success. Maybe this is a weird fluke and maybe it isn’t, but it’s certainly interesting since Grisham is such an extreme outlier in this regard. Batted-ball oddities aside, Grisham held his own offensively as a 20-year-old in High-A, has played center, and steals a ton of bases. Once a fringe defensive center-field prospect, Grisham now projects to left field, as he’s only an average runner — his stolen base totals are a result of instincts, not pure speed — and has a fringe arm… He could be an above-average regular but, because because he’s limited to the outfield corners, the profile unravels if Grisham’s bat-to-ball skills don’t progress. I will concede that the stolen-base totals fool KATOH into thinking Grisham’s a bit faster than he is. But the bigger question is whether Grisham’s hitting is truly better than his stat line suggests or whether his extremely atypical batted-ball profile is breaking KATOH. The answer to questions like that is almost always “a bit of both.” Perhaps someone who’s seen him play on a regular basis (or someone with exit velocity readings) could provide more clarity on this question. Even if he’s a .250 hitter, though, adding on all of his walks makes him an on-base machine who also provides value with his legs. Yes, he’s mostly a corner outfielder now and he doesn’t have corner-outfield power. But Brett Gardner has had an exceptional career doing Grisham-esque things from a corner-outfield spot. Rogers hit an impressive .319/.377/.488 in High-A last year with an eye-popping 70 steals. He struck out an encouraging 16% of the time and actually hit for a modicum of power, due in part to hitting fewer grounders than previously. His outfield defense is not very good and his power is still nearly non-existent, but his speed and 6-foot-3 frame are both positive indicators. The physical tools of a useful bench outfielder are there, but he’s still pretty raw defensively, and the swing doesn’t inspire confidence for sustained success against more advanced pitching. There are multiple holes and ways for pitchers to attack, though he’ll keep them in the zone. Rogers’ numbers are quite good, the speed is real, and he’s 6-foot-3. On the other hand, though, he was a 23-year-old playing in a hitter’s park in High-A. Also, he’s already moved to left field, where his defense has not been good. KATOH is finely tuned to weigh all of these pluses and minuses; it still comes up with a very good projection. KATOH’s raison d’être is to identify atypical prospects who are deceivingly good, and Wes Rogers fits that bill. I firmly believe he is an underrated prospect, but I would be lying if I said I was 100% confident in his projection. Banda’s 5.39 ERA unfairly draws attention from the things he did well last year — like, most notably, record a 22% strikeout rate. His 4.48 xFIP likely tells the more accurate story. And while that still doesn’t sound terribly great, it isn’t half bad coming from a 23-year-old starter in the PCL. Young starters who can hold their own in Triple-A often have success in the majors, even if it comes in a relief role. KATOH also remembers his strong 2016 season, when he recorded a 2.88 between Double-A and Triple-A. Banda doesn’t really have blow-away stuff. It’s a plus fastball from the left side, and the curve and change will both flash above-average or even plus, but are inconsistent at present… The command profile is fine, but not enough to make the raw stuff work when on the nights when the secondaries are fringy. Banda isn’t the most exciting prospect out there, but he’s an MLB-ready starting pitcher who already has some big-league success under his belt. That alone makes him a good bet to produce a WAR total commensurate with that of a back-end top-100 prospect. Listed at 6-foot-10, but apparently still growing, Young baffled New York-Penn League hitters his first year out of high school. Across 13 starts, he struck out a remarkable 27% of batters faced, walked just 6%, and also induced grounders 53% of the time. The end product was a 2.77 ERA, which was actually higher than his ERA estimators. Despite pitching as a 19-year-old in a league filled with college draftees, Young was nothing short of dominant. Young pitches with a fastball in the high 80s that touches 90-91. He has a loopy slow slurve that is currently below average. He also has a changeup that is also not an impact pitch…. [There is] a chance that he never adds velocity and ends up just a LOOGY with a funky delivery. Young is obviously a few years away from the majors, and projections for short-season players should always be taken with a grain of salt. Not only is the level of competition lower, but the samples are smaller and there’s a lot of development that still needs to happen for those players. He’s also weird in general, largely due to his height. For these reasons, I would easily take the under on Young’s projections. But he’s definitely worth monitoring and I’d argue he should at least be on everyone’s prospect radar. Although he’s yet to turn 22, Castellani spent all of 2017 at Double-A, where he was fairly effective. While he didn’t put up big strikeout numbers, he also didn’t walk many batters and was solid across the board. The end result was a 3.96 xFIP, which was nearly a run lower than his ERA. A 6-foot-4 21-year-old who pitched decently as a starter in Double-A sounds very much like a prospect. [H]e struggled to maintain his stuff into the sixth and seventh inning. The fastball would dip to 89-92 and start sitting up in the zone. The slider would get a little lazy. The change flashes but can lack bottom and needs further refinement. Slider can be more of a barrel-misser than a bat misser. There’s a curve, but it’s a show-me pitch. I’ve never totally understood why Castellani doesn’t get more love from prospect rankers. His stuff seems solid enough and he pitched pretty well as a starter in Double-A last year at the tender age of 21. I firmly believe he’s one of the most underrated pitching prospects in baseball. After years of injury-plagued mediocrity, Flexen broke out in a big way last year. In 10 starts between High-A and Double-A, he pitched to a sparkling 1.76 ERA, making him one of the top-performing pitchers in all of the minors. Very few starters are capable of dominating Double-A hitters like that, and Flexen did it as a 22-year-old. Flexen doesn’t always hold his 94-95 into starts and sometimes it doesn’t show up at all. When he works more 90-93, that’s not really enough velocity to cover for just average command and movement, and he rarely had even average command in his major league outings… [Flexen’s curve’s] shape and command are inconsistent. The changeup is fringe-average at best. It’s important to note that KATOH ignores anything a player’s done in the big leagues, and Flexen’s early big-league results have been putrid: a 7.88 ERA with bad peripherals to match. Flexen pitched like an elite prospect for a half-season in the minors last year but doesn’t have much of a track record outside of that. Whether he’ll get back to that level (and stay healthy doing it) is anyone’s guess. He could make KATOH’s forecast seem really smart or really dumb. I wouldn’t be at all surprised either way. Despite spending 2017 as a teenager in A-ball, Wilson pitched very effectively. He struck out 25% of batters faced, walked very few, and also ran an impressive 52% ground-ball rate. The end result was a 2.50 ERA across 137 innings. He was even more dominant in his short Rookie-ball stint in 2016, posting a 0.68 ERA, 29% strikeout rate, and 64% ground-ball rate. He’s a teenage strikeout/ground-ball machine. His offspeed is just average, sometimes fringe. Given the demeanor and stuff, it may play best in a Chad Green role rather than as a 200-inning starter. He’s very likely to put up a couple WAR in the bigs, though. I’m having a hard time not falling for Wilson’s Low-A performance. His blend of strikeouts and grounders is awfully enticing, particularly coming from someone so young for his level. And unlike Kyle Young, he seems to have solid stuff and isn’t just a strange case of a pitcher fooling low-level hitters. Scott was nails as a 22-year-old in Double-A last year, pitching to an impeccable 2.22 ERA with a 30% strikeout rate over 24 starts. Those starts, of course, were only starts in the academic sense: Scott averaged just 12 batters faced over three innings. Nonetheless, he was dominant despite having to face many hitters a second time. Scott could stand to cut down on his walks (a lot), but he clearly misses bats and also induces a lot of grounders when batters do put the ball in play. He only works from the stretch, and there is not enough changeup here to start. This is a reliever all the way, and you’d like to see a little more slider and a lot more command before you throw a ninth inning grade on him. Scott has little left to prove at this point. His stuff is off the charts, he’s shown he can use it to baffle high-minors hitters, and he’s only 23. Scott’s Double-A performance was Chapman-esque, and I think he’s someone who could theoretically step in to a big-league bullpen right now and be an effective multi-inning reliever. *Bryse Wilson should not have been eligible, as he was included on Keith Law’s top 100. Rather than stripping him of this highly coveted distinction, I am just adding an extra starter. We hoped you liked reading The 2018 All-KATOH Team by Chris Mitchell! Nice to see the Bryse Wilson Love. But, he is 52 on the ZiPS list, and 68 on KLaw’s list. Good catch. Rather than crushing his hopes and dreams by stripping him of this prestigious award, I added an extra starter to the list. Truly, you are a benevolent, even magnanimous dictator. Thanks again to you and the whole FG crew for doing this awesome prospect week stuff. I wouldn’t think that being on ZiPS list, another stat-based endeavor, should disqualify from this list (though of course he was also on ESPN’s).